Allllll my favorite 2017 Planners. PLANNERS. Oh my heavens, do I love planners. I would say the effort I put into finding a great planner surpasses my effort in finding a good wall calendar… which if you recall is fairly high on my life importance list. So now that we’ve got THAT out of the way, we can move onto Allllll my favorite 2017 Planners. Some people hoard shoes. Some people hoard fancy purses. I’m that cool kid that hoards paper products and office supplies (check out #officesuppliesaremycrack – most of those pictures are mine, people). Call me old fashion, but there is something wonderful about putting pencil to paper. Don’t get me wrong, I use various digital calendars to keep my family’s schedules on track. I share what feels like a million Google Calendars with my husband. But when it comes to blogging and those types of daily tasks I need to keep on top of, I always use a paper planner. Today I am sharing all my favorite ones… which just so happens to be 12 of my 99 favorites. 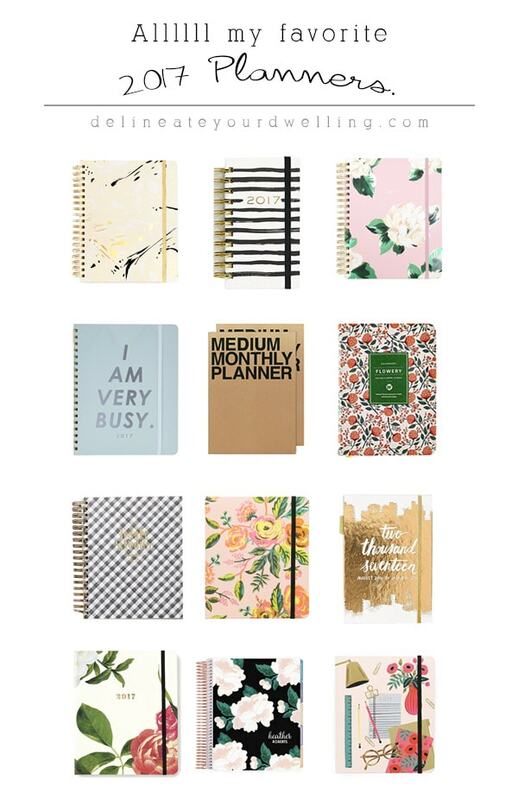 What planner are you going to get? Honestly, I’d love to know! I love my bullet journal!!! Ooooh! I’ll have to go check that one out, right now! Yeeessss!!! Bullet Jounal has changed my life. I never knew what a planner and list maker I was until I discover Bullet Journal. And the best part is that you can use any notebook you want, or add your own touches to each page as you choose. It can be the most simple, minimalistic approach, or can be as embellished, colorful articulations as you desire. It is the best at capturing everything in my brain, gives me all the pages and space I need to organize, sift through, and plan for the future, helps me stay on top of EVERYTHING I need to do NOW, and captures the moments I want to remember or cherish and also gives me the ability to have some sort of data to really reflect on so I can see meaningful progress or where I can actually makes significant changes. A life changer. Bulletjournal.com. And I’m a lover of the Leuchtturm 1917 dot grid notebooks. Delicious color options.